The Toxicologist Today: Why is adrenaline prescribed in an anaphylactic shock crisis? Why is adrenaline prescribed in an anaphylactic shock crisis? As a Medical Information Officer I am constantly bombarded with situations where, among several other possibilities, allergic reactions are eventually reported as adverse events. However, I never got to be confronted with a patient undergoing anaphylactic shock. What I realised though is that most people out there do not have a precise or at least mildly accurate idea of what an anaphylactic shock is. They just know the term but lack the understanding. In addition, if you ask most of your friends and relatives why medical doctors prescribe adrenaline (epinephrine) to counteract an anaphylactic shock crisis, well above 90% will roll their shoulders in ignorance. It's understandable that we cannot know it all about everything, but I have always been a curious bee. And the moment this question popped up in my head a few years ago, I had to research to address it immediately. By surprise, it happened to me today to find someone (outside work) who didn't know about the reason behind the use of epinephrine (adrenaline) as an antagonist of such systemic allergic chain of events. A bee stings your child in the neck... let's go for neck rather than hand to add a bit of a physical oddness and proximity with the heart that will enhance the emotional atmosphere of scare. Your child is allergic to the substances present in the bee sting injection and the body starts producing an allergic reaction. Don't forget that an allergy is just the immune system considering a substance to be foreign to the system and therefore an attack on that substance (known as allergen) is initiated. But sometimes the response is inappropriate and imbalanced leading to a systemic chain of events that put the whole cardio-respiratory system in alert. What happens next in the hypersensitive body is an anaphylactic response that, by means of biochemical and physiological procedures in your child's body, will try and block the access of that substance (allergen) to the vital organs. Naturally, your child's body produces adrenaline that will ease the physiological extreme responses of her/his body to the allergen, meaning his/her body will try and block the effects of the allergen by reducing the blood flow and consequently constricting the airways. However, in a person with hypersensitive immune system the body needs a lot more adrenaline because it is in severe shock already, hence an immediate action is deemed necessary. The only available option is the epinephrine injection that is usually administered to the patient as an urgent first aid approach. Why an injection? Simply because adrenaline is a natural hormone produced in humans and is easily degraded by the stomach acids. In the event of an anaphylactic shock your child will need higher doses of adrenaline than normal, and quickly accessed. The intramuscular injection of adrenaline with what is known as an EpiPen operates miracles. What does it do? Adrenaline will reduce the throat swelling and open your child's airways allowing him/her to breath naturally, it will normalise your child's blood pressure and overtime bring your child's impaired cardio-respiratory system to a normal point where medical intervention (if necessary) will be monitoring his/hr health. I hope this quick-fix worked as an EpiPen for your questions in case you had any! Thanks for visiting The Toxicologist Today. 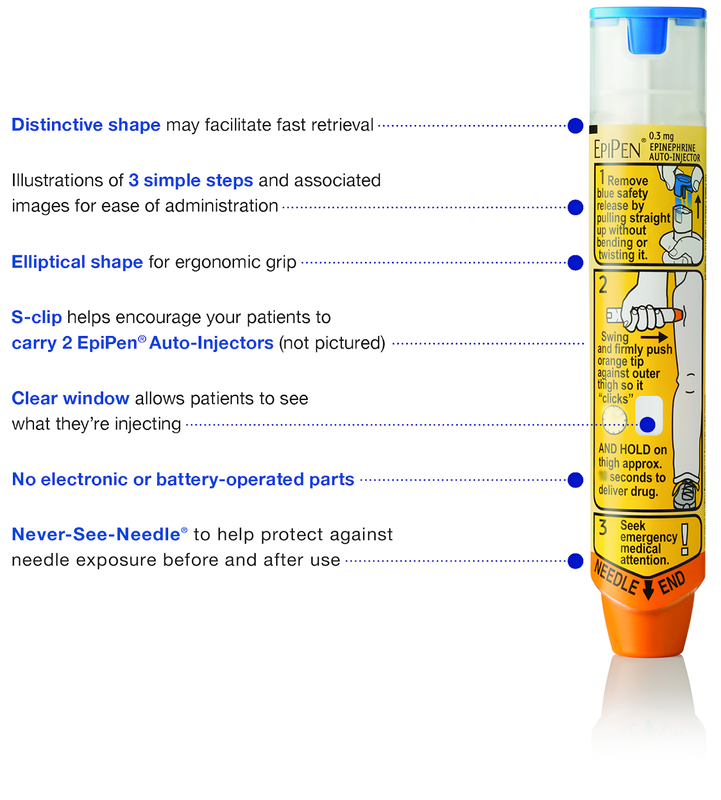 Now, do you know what you can use if you're in the wild and have no access to a much needed EpiPen? Stick around and you'll find out in the coming post. 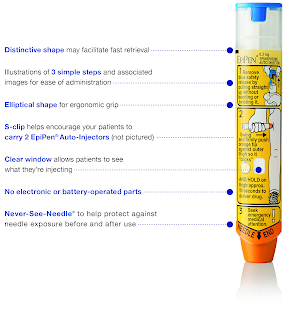 1st image kindly taken from EpiPen prescribing information, [https://www.epipen.com/hcp/about-epipen-and-generic.aspx]. 2nd image kindly taken from The Telegraph, [https://www.telegraph.co.uk/news/health/news/8796536/Bee-sting-vaccine-on-the-NHS.html].